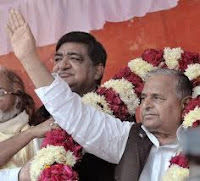 Samajwadi Party president Mulayam Singh Yadav today said all the criminals would be behind the bars to establish rule of law if his party came to power in Uttar Pradesh assembly polls. Addressing an election meeting here, he said that no goonda raj would be there in SP regime and the place for the criminals would be the jails. Attacking the Congress, Mr Yadav said the ruling party at the Centre was in jitters because its government would be shaken if SP came to power in UP. The SP chief said the public of Uttar Pradesh was fed up with the deep rooted corruption in the state by Mayawati government and decided to uproot the BSP government from here. '' The people of Uttar Pradesh have already chosen SP as an alternative to corrupt regime of Mayawati-led Bahujan Samaj Party,'' he claimed. He alleged that the Mayawati government had grabbed 10,000 acres of land from Lucknow to Noida which was a big scam.